Rabbi Gabriel Greenberg speaks at the Beth Israel 10th anniversary commemoration of Katrina last August. A two-alarm fire destroyed the home of Rabbi Gabriel and Abby Greenberg of Beth Israel in Metairie on April 19. According to information sent out by the congregation, the fire began in the kitchen and “consumed their home and nearly all of their possessions.” When the fire started, Rabbi Greenberg and the children were in the yard, and there were no injuries. Bradley Bain, president of the congregation, said the community has already begun to assist, and asked that calls and texts directly to the Greenbergs be limited. 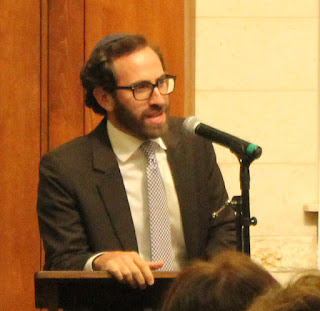 Financial assistance and contributions of goods can be made through Rabbi David Posternock, the congregation’s administrator, in the Beth Israel office. A GoFundMe campaign has also been set up for them. It can be viewed here. In less than 24 hours, the fund was close to its initial $50,000 goal, with 620 donations from around the world. They thanked the Jefferson Parish Fire Department for their efforts in extinguishing the blaze and keeping it from spreading to neighboring homes. It took less than 15 minutes to extinguish the blaze, but there was extensive water, smoke and heat damage. The Greenbergs have been at Beth Israel since June 2014. The congregation was flooded out of its previous building in the aftermath of Hurricane Katrina and rebuilt in Metairie, dedicating its current building in 2012. Dahlia Topolosky, whose husband Rabbi Uri Topolosky was rabbi of Beth Israel before Greenberg's arrival, said "we are very shaken" by the news, as this had previously been their house. Their new congregation, Beth Joshua in Rockville, Md., is collecting contributions. Rabbi Topolosky said he had heard from more than a dozen people in his area of suburban Washington this week that their ovens had been broken by the self-clean cycle while preparing for Passover. He urged people not to use it, saying "Fire officials and oven repair workers that I have spoken to consistently report the dangers of this feature." He said an oven and oven racks may be kashered for Passover by cleaning it out and then setting it to broil or the highest setting, usually 550 degrees, for at least 40 minutes.